We decided to take the train from Ollantaytambo to Aguas Calientes (in order to get to Machu Picchu) which would allow us to visit the Sacred Valley on the way. 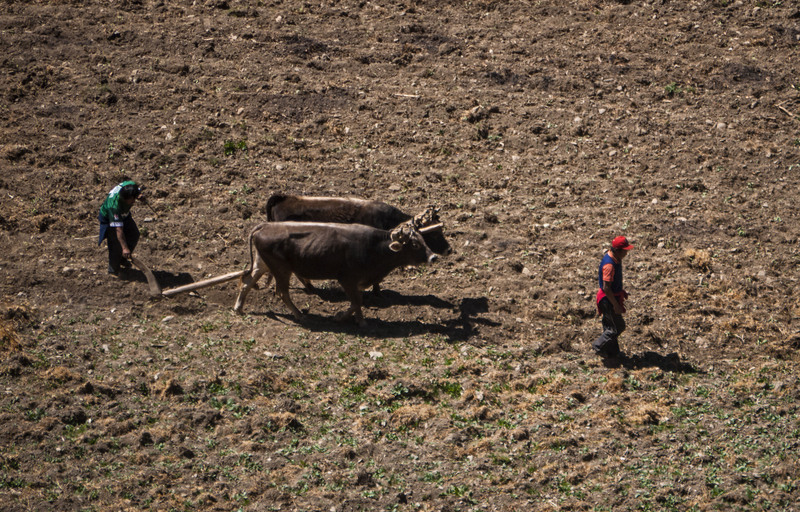 The Sacred Valley is a steep sided river valley with a narrow but extremely fertile alluvial plain. 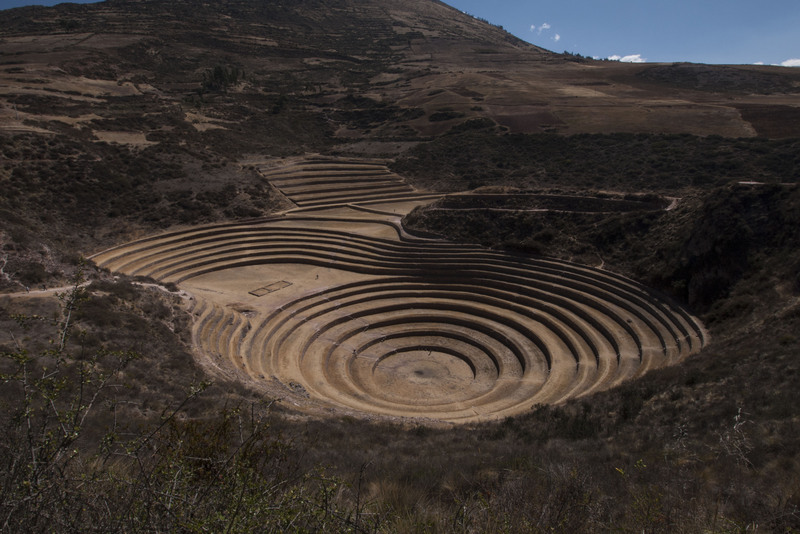 This plain was heavily exploited agriculturally by the Inca. The Rio Urubamba provides the water source for this valley and this is the river that flows below Machu Picchu. 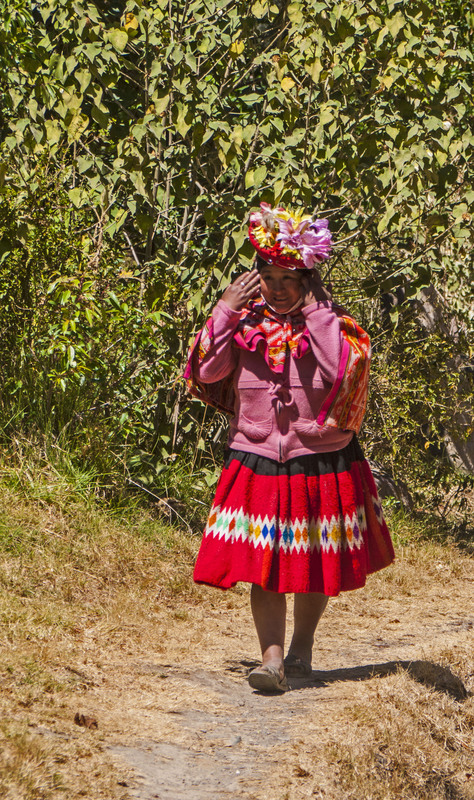 From Cusco to Ollantaytambo via Pisac is around a 3-4 hour drive and is through a beautiful valley (the sacred valley). There are a number of Inca ruins to stop off on the way. We decided to visit Moray on the way. 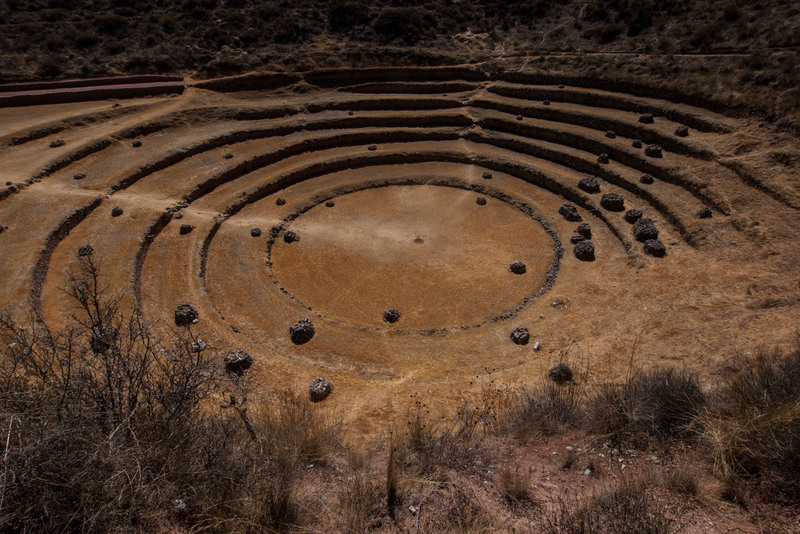 Moray is an Inca agricultural laboratory that was used to assess the growth of crops under different climates. Each of the terraces in the circles provided a slightly different microclimate. Unfortunately to get to Moray you have to drive through the town of Maras. This wouldn’t have been so bad if the Plaza de Armas wasn’t completely dug up and a building site. This meant we had to drive through a diversion which took us through some really narrow lanes and we got a little lost so had to drive around the town much more than necessary. After leaving Moray and driving, a bit more directly this time, through Maras we headed to Ollantaytambo. 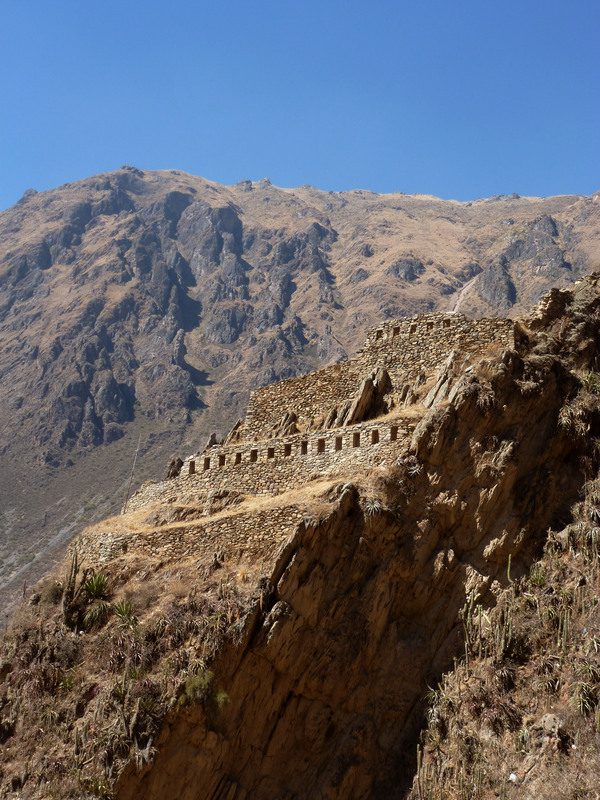 We had the address of hotel that supposedly took overlanders, the Ollantaytambo lodge. However they told us we couldn’t stay. Fortunately just down the road was a lovely Cochera, guarded parking lot, with lots of space and a lovely grass surface – even a toilet – who were happy for us to stay. 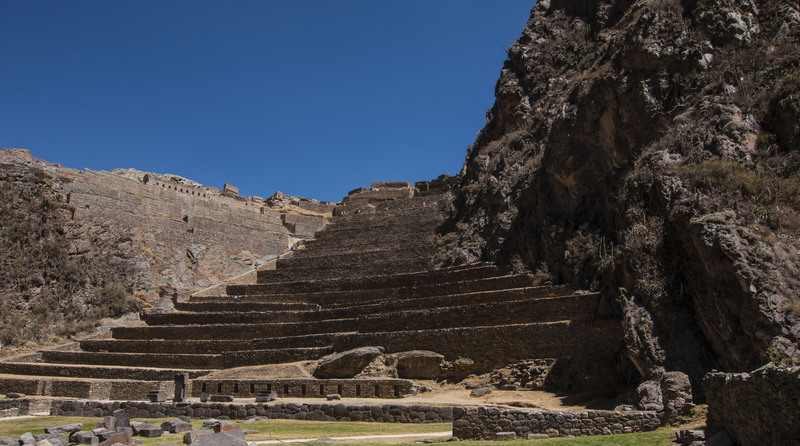 The town of Ollantaytambo is a lovely and relaxed town, despite the large number of tourists who pass through on their way to Machu Picchu. There are a number of good restaurants and some small shops with surprisingly good stock. The only downside is the traffic entering/exiting town where there is a one lane road bottleneck which can cause substantial tailbacks. 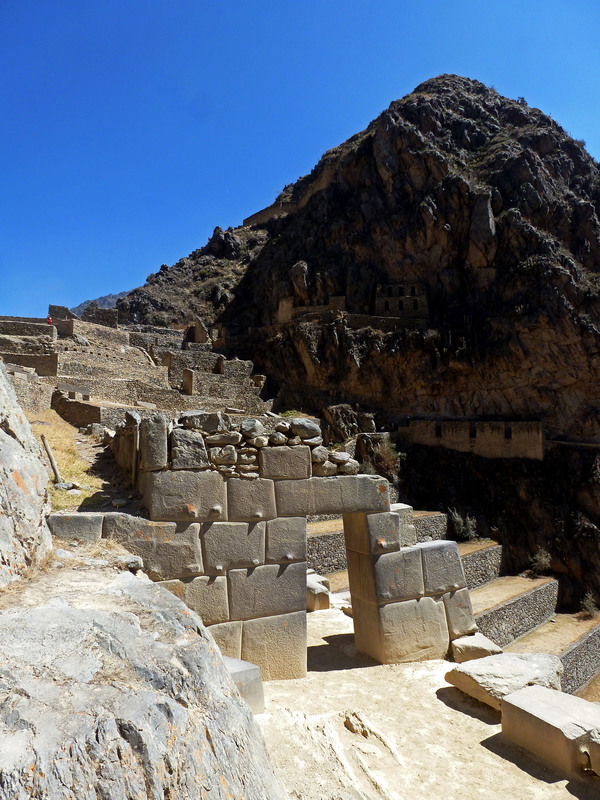 We overnighted here and the next morning headed to the ruins at Ollantaytambo early. 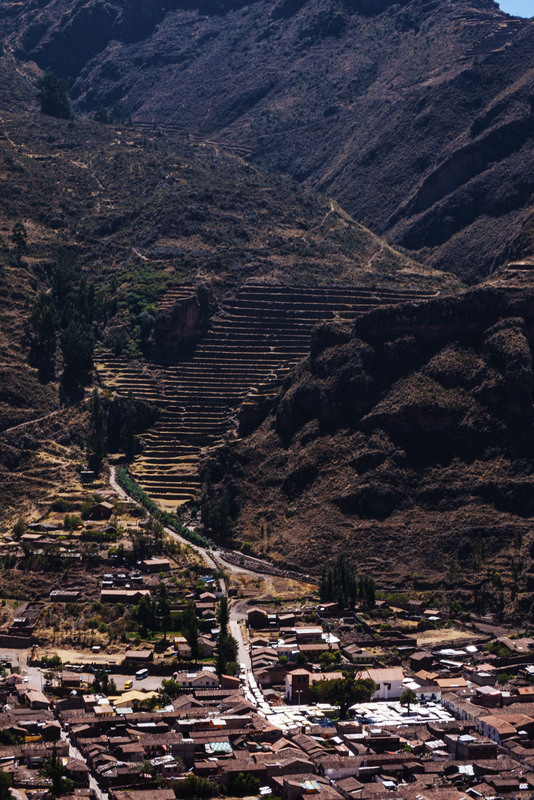 This was the fort guarding one end of the Sacred Valley (the other end is guarded by the fort at Pisac). These ruins were very interesting with agricultural terraces, great views of the valley, a ceremonial district and even a baths area. The baths area was really interesting as there were lots of channels diverting water from the river to different places in the ruins. After a couple of hours visiting these ruins we needed to go back to the truck and get our stuff. We had a 2pm train to Aguas Calientes for our trip to Machu Picchu.